The senior partner of an investment brokerage, Jeffrey Desange, has a breakdown due to a financial collapse and kills several co-workers and his estranged wife. He then kidnaps his two young daughters. He drives his car recklessly through a winding snow covered road. He loses control of his car and drives off an embankment. He finds an abandoned and isolated cabin where he plans to kill his daughters, but the children are saved by a dark ghostly image. After five years of searching and depleting his savings, Jeffrey’s twin brother, Lucas, finds the children that were raised without social interaction and claim that they have been raised by ‘Mama’. “Mama” has all the elements to make it a great, creepy horror movie. It starts very strong with a somewhat hazy situation with a desperate father who killed his wife and abducts his children to an unknown destination. I suppose it’s a family tragedy in the making caused by an economic crisis. However, the plan to kill the two sisters Victoria and Lilly goes awry after an accident in which they end up in a remote cabin in the woods. Here, the father ultimately can’t carry out his act of desperation by the intervention of a blurred (as seen through the eyes of Victoria who is visually impaired) being who appears to be “Mama” afterwards. What follows is for me one of the most impressive forbearing scenes of this movie, namely when the two girls are found after 5 years. The image of the two swinging, smeared with mud, humming sisters on the refrigerator where they moved to with high speed in an arachnid way. Succeeded by the images in the psychiatric institution where the sisters are in observation and where it’s shown how they have evolved into the skittish underdeveloped beings through their prolonged isolation. The moment when Victoria suddenly appears in the viewing window is an impetus for similar horror elements and it made ​​me think of Samara from “The Ring“. When Luke, the brother of the missing father who has custody of the two sisters, moves into a house offered by the institution where the accompanying psychiatrist works, together with his girlfriend Annabel, it appears that something else has nested itself there too. Luke ends up in the hospital because of “Mama”, so Annabel is all alone to take care of the two sisters and that’s when the trouble starts. The story on its own has been told countless times in other haunted-house movies. Although it is not really a haunted-house movie in the purest sense of the word. A bundle of cliches from other horror movies pass in review including the soundtrack. Ok, it’s cheap but I have to admit that most horror movies depend on it, and without it, it seems rather that you have seen a fairy tale instead of an unnerving horror/scary movie. In other words, it has to be like this. The acting of the two girls was a top performance. Especially Isabelle Nélisse looked terrifying and demonic. Suddenly emerging from the darkness with the expressionless gaze and then disappearing lightning fast while giggling. She was also the only one of the pair who unconditionally accepted “Mama” as her natural mother and couldn’t or wouldn’t say goodbye to this entity. Megan Carpentier wasn’t such a strong and convincing person, but that was more in line with the character. She quickly made ​​the transition to the more human world and accepted Lucas (Nikolaj Coster-Waldau) and Annabel (Jessica Chastain) as surrogate parents. That’s why she rejected the request of Lilly to go outside and play with “Mama“. Lucas quickly disappeared out of the picture, and therefore played a minor role. Annabel on the other other hand was also a strong interpretation. An alternative rock chick, with absolutely no maternal instinct (I thought she was pleased that the pregnancy test was negative in the beginning of the movie). She evolves into a mother figure after a while who really cares about the sisters. But the strongest character turned out to be the creature “Mama“. I read here and there about the bad CGI or irritating SFX, but I haven’t noticed any of this. I found it a compelling and terrifying spectacle. 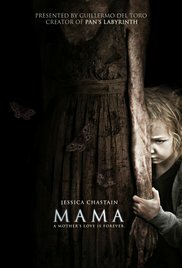 To my surprise I saw the name Javier Botet between the other actors on IMDB as the interpreter of “Mama“. This person was told at the age of 5 that he’s suffering from the symptoms of Marfan. A deviation that causes a person to grow to an unusual height with long, skinny arms,legs and fingers. He uses this natural anomaly to play personages like “Mama” and “Medeiros” in the “[REC]” movies. The CGI is subsequently projected on it. This gave the figure “Mama” a more realistic figure. The only laughable thing was the wig shuffling over the floor. They could have worked that out in a different way. Eventually I thought it was a frightening movie with a very intense atmosphere and properly placed scare moment (and I’m not easily scared). Again this shows that a good horror doesn’t always require the necessary gore elements to make it oppressive. Personally I thought the end was a bit far-fetched. Just like in “The Woman in Black” the found remedy doesn’t eliminate the curse.